As you see he's a very creative person... 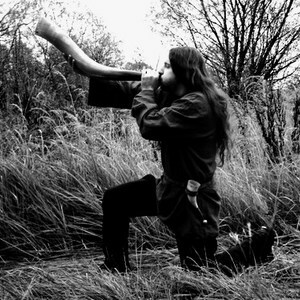 Under the name Slavland he plays slavonic pagan metal with some folk parts. In the year of 2001 he created two demos: 'Kiedy krzy? w s?owia?ska ziemie wbito...' and 'Oddech Swi?tego Gaju'; but because he wasn't satisfied with them, they weren't distributed at all. In the year 2002 he recorded the first full-length called 'Pies? Gromu' which is much better than his previous works. This album is now being released on tape by Nawia Productions. In the same year Belzagor created another full-length album 'G?stwiny Dr?g Zapomnienia' which is a little rougher. This album will never be released because it doesn't satisfy Belzagor fully. And now I have here the third work of Slavland - it's called 'Zapomniane Kurhany' and it's the most mature music of Slavland. There are some plans to release it on CD (Nawia? ), but not earlier than in the year 2004. Musicaly speaking Slavland plays very fast and harsh pagan metal with some folk parts (some of them are real folk instruments! ).